Jamaican-born American rapper, record producer, singer and actor, born 24 May, 1967 in Mandeville, Jamaica and and died 8 November, 2011 in Los Angeles, California. 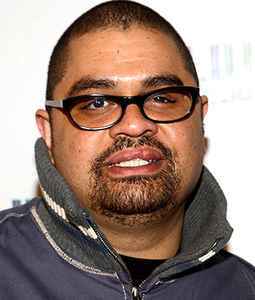 Heavy D was raised in Mount Vernon, New York, where he began to experiment with rap and rhyme at the age of eight. By the time he had reached high school, he had summoned a friend, DJ Eddie F, to help him write songs. Heavy D. and the Boyz (Eddie, G-Wiz and Trouble T-Roy) signed to Uptown in 1986 and released 'Livin' Large' the following year. 'Big Tyme' surfaced in 1989 and produced a platinum hit, "We Got Our Own Thang." The following year, Trouble T-Roy was killed in an accident. Subsequently, Heavy D. released 'Peaceful Journey' in 1992, a tribute to his long-time friend. "Now That We Found Love" went gold that same year. He later joined the Uptown Records team and began managing the company before it folded. He also began an acting career. I still listen to the 1991 album Peaceful Journey. R.I.P. Heavy D.
Farewell The Heavster, you were one of the good ones, one of a kind and really diverse, Hip Hop has lost a huge talent losing you...T.R.O.Y now Heav. Goodbye, Heavy D. You were a great one.